War stories and life lessons from the industry’s top writers. BEFORE: Today’s the start of a new week and it also brings the start of a new chain. To get in that back to school mode, I’ll be watching documentaries for two weeks. Inside the documentary chain, there will be various subchains. For example, the first couple documentaries are film related beginning with today’s Tales From the Script. Other subchains include pop culture and various topics about the United States. I view documentaries a little differently from fiction films and even films that are based on a true story. When I watch fiction films, I want a entertaining story and a visually pleasing experience. With documentaries, the primary goal is to educate or otherwise tell a factual, real-life story. Now if a documentary can also entertain me; even better. That’s to say, as I write about these films, I’m looking to be educated in an unbiased way (I’m looking at you Michael Moore) and how effectively the teaching is done through the documentary. Anyway, enough talk, time to reactivate my brain cells for the year. AFTER: Tales From the Script has interviews with a myriad of famous, and not so famous, screenwriters. The stories they tell of their real world experiences are fascinating and taught me many things about the industry that I had no clue about. Did you know that Amadeus, the Academy Award winning film had 46 drafts before it was made? Another thing I liked about this film is that most of the screenwriters were very humble and acknowledged that it is by no means an easy business. 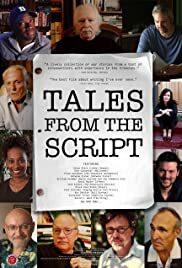 It took some more than a decade to get their first script sold. Others sold scripts at age 20 but then had no luck for ten years. Almost everyone had at least one interesting story of their experience in the industry and the effect it had on them. The downfall of this documentary is it’s structure. The film is split into multiple sections with a title card at the beginning that gives a very broad and vague overview of what the section will be about. Each section is then composed of short excerpts of the interviews with the screenwriters. While it’s nice that the focus is placed solely on the screenwriters, the lack of narration makes it really hard to follow along the point the filmmakers are trying to convey. The brevity of the interview clips also makes it hard to follow along. Frank Darabont talks about The Shawshank Redemption for twenty, maybe thirty seconds and then you go to Shane Black talking about Kiss Kiss Bang Bang for another half minute, and so on. The positive is that we get to hear about the industry and writing from the writers themselves, but they aren’t given enough time to flesh out ideas by themselves. Instead, writers with similar, but slightly varying experiences are all jumbled together into one, mostly incoherent narrative that’s hard to follow along.